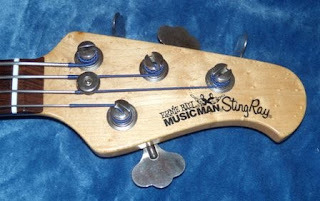 MusicMan month is nearing its end, and I realize that I have not written about the instrument that the brand is best known for: the Stingray bass. 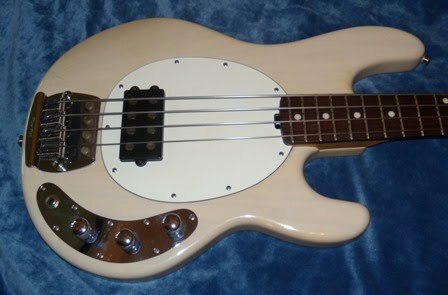 The Stingray was designed by Leo Fender, Tom Walker and maybe Sterling Ball (I cannot exactly remember what he said his role in the bass was), and it was introduced in 1976. It was initially available only as a 4-string with a single humbucker pickup, a two band equalizer, and active electronics. 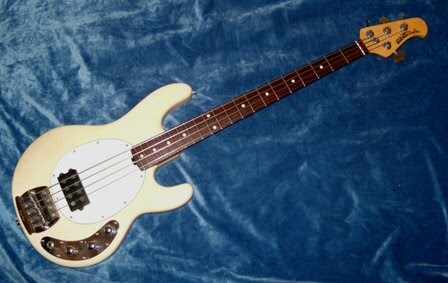 This was one of the earliest productions basses with an active pre-amp, if not the first. This gave it more output and a more aggressive sound than the competition. The Stingray pretty much has Precision Bass ergonomics, and the neck profiles are very similar between the two. - Bodies are now contoured. - Neck joints have changed from 3-bolt, to 4-bolt, to today’s 6-bolt for improved stability. 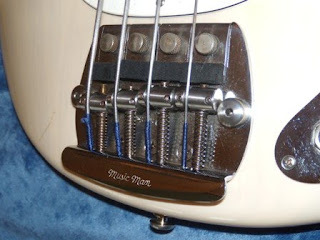 - The truss rod adjustment point has been changed from a bullet-style to an easier to use trussrod wheel at the heel of the neck. - Neck finishes are now available in smooth gunstock oil and wax or durable poly (on the classics only). - The electronics more varied now, with a 3-band e.q. option, as well as double humbucker, humbucker/single coil and piezo pickup offerings. Sll of these changes and options are great, and can give a customer and almost Custom Shop-like experience when ordering their Stingray. The bass pictured here is a 1993 Mary Kay Stingray. It has the original trans white finish with a non-matching headstock, and is very rare. Only 30 Stingrays were made in this color, and only 5 with a 2-band pre-amp. It is in very nice shape with only one scratch by the bridge, and some normal yellowing of the finish. The neck is a dream. It is true, and the truss rod works freely. This is from the era when they still used birdseye maple, and this one is nicely figured. The high-quality MusicMan hardware is all present and in great condition. The bass is all original. There have not been any repairs or modifications at all. It weighs in at 9 pounds, 2 ounces according to my scale, which is super-light for a Stingray. 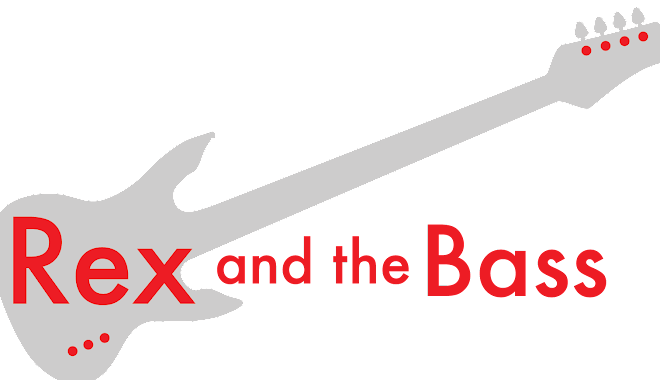 Hey Rex, I have come to be the owner of this bass, I'd be curious to know anything of it's history you might be able to tell me. Cheers! I have one of these I brought new late 93...still sounds great but the paint has yellowed quite a bit. I can't find jack s**t on on it other than here.